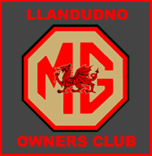 When we moved from http://www.mg-cars.org.uk/LlandudnoMGOC/index.htm, we moved some of the content to this new site. It wasn’t practical, or possible to move everything. Temporarily, the old content is available at mg.barbatun.com If there’s anything there that you think needs to be moved to this site please let us know. Only exception being the odd logo that drifts around the home page – that’s been consigned to where it belongs.